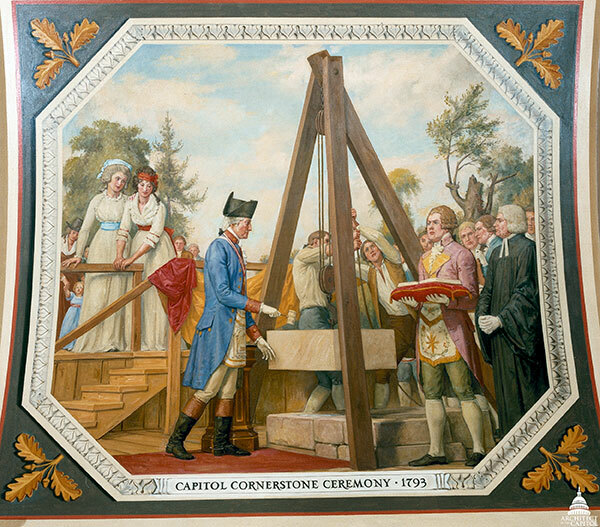 The cornerstone was laid on Wednesday, September 18, 1793, during the first large public event staged in the federal city. Contemporary Masonic practice included the laying of an inscribed metal plate along with a cornerstone. Caleb Bentley, a Quaker clockmaker and silversmith who lived in Georgetown not far from Suter's Fountain Inn, where the commissioners held their meetings, made the silver plate for the Capitol ceremony. The Capitol is in progression—the southeast is yet kept vacant that [the] cornerstone is to be laid with the assistance of the brotherhood [on] the 18th Inst. Those of the craft however dispersed are requested to join the work. The solemnity is expected to equal the occasion. Joseph Clark, R. W. G. M.—P. T.
The plate was handed to Washington, who stepped down into the foundation trench, laid the plate on the ground, and lowered the cornerstone onto it. With the president were Joseph Clark and three "worshipful masters" bearing the corn, wine, and oil used to consecrate the stone. Chanting accompanied Washington’s ascent from the trench. Clark gave a speech punctuated by numerous volleys from the artillery. Following the formal exercises, a 500 pound ox was barbequed and those in attendance "generally partook, with every abundance of other recreation." By dark, the festivities had ended. A painting of this ceremony (pictured above) appears in the Cox Corridors of the U.S. Capitol Building's House Wing. A panel of the Senate Bronze Doors also displays the scene. Architect of the Capitol George White and Senate Sergeant at Arms Martha Pope look on during search in 1991. In 1991, a search for the Capitol Cornerstone was conducted including use of a metal detector to locate the engraved plate—it was not found. The location may be under the south east corner of what is today National Statuary Hall.